Matthew C. Reiley of New York City is a sculptor with over 16 years of experience in the fine arts profession. 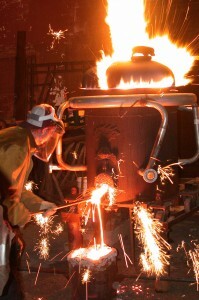 A former apprentice and staff member of the Johnson Atelier Technical Institute of Sculpture, he was immersed in foundry processes and strongly drawn to cast metal as a creative medium. In 1999, he founded AbOminOg Intl. Arts Collective, which is headquartered in a former foundry in Trenton, NJ. The collective is a core group of dedicated artists who collaborate to make sculpture and share a desire to bring the craft, experience and spectacle of cast metal art to the Tri-State region and beyond. Reiley’s artworks appear in private and permanent collections. As Associate Director of Conservation/Senior Conservator for Central Park Conservancy, he is responsible for the care of Central Park’s built environment, which includes a collection of 50+ bronze and stone monuments, historic architecture, fountains, mosaics and other features. Reiley is an Adjunct Faculty Member of the the Graduate School of Architecture Planning Preservation (GSAPP) at Columbia University and a Professional Associate of the American Institute for Conservation of Historic and Artistic Works (AIC).